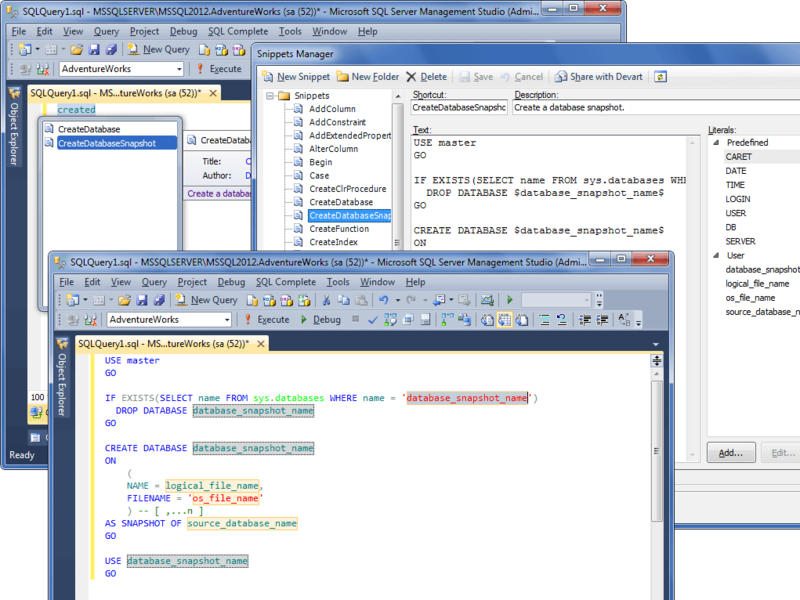 dbForge SQL Complete is a useful add-in for SQL Server Management Studio. 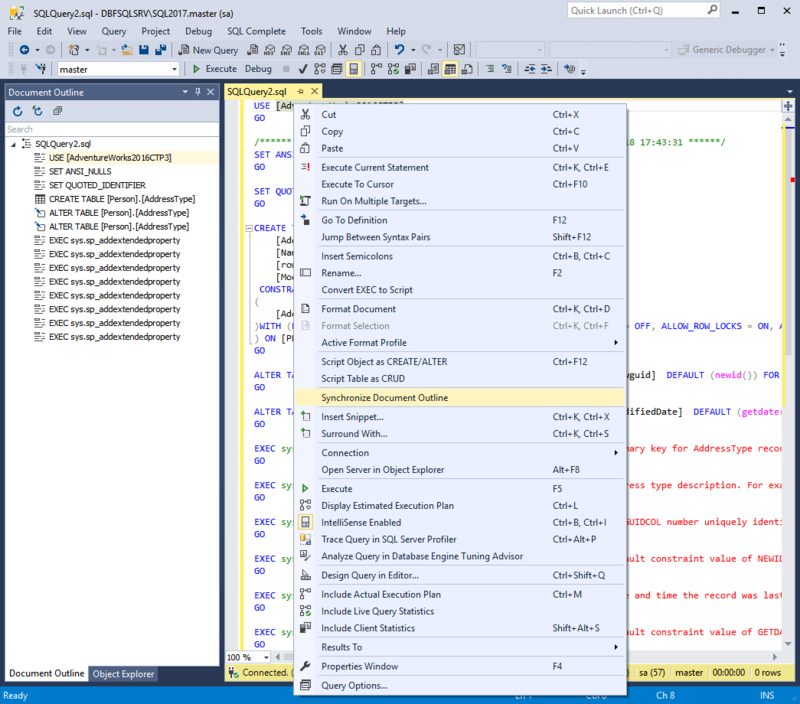 It offers powerful autocompletion and formatting of T-SQL code and has many distinct advantages over native Microsoft T-SQL Intellisense. SQL Complete prompts the most appropriate expressions when you are writing SQL code. 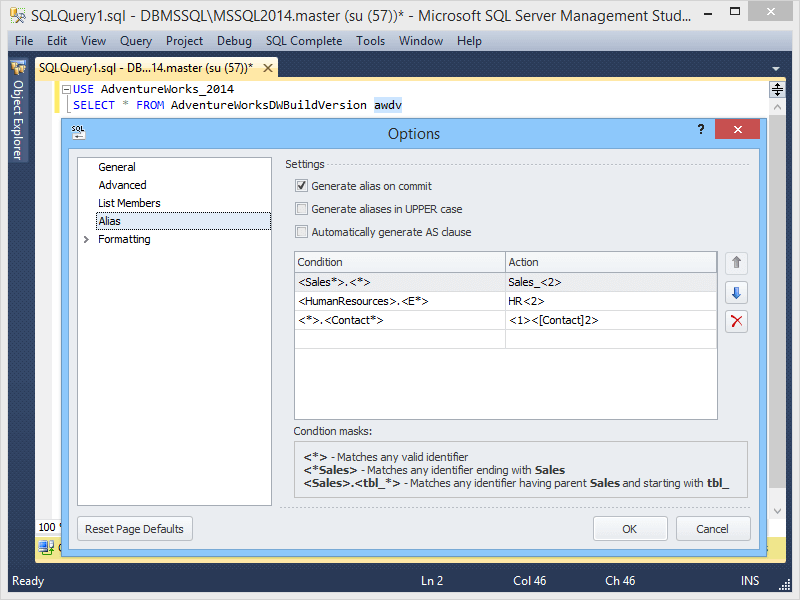 Besides extending List Members, Complete Word, and Parameter Info features, SQL Complete adds SQL Formatter to enrich the developer toolkit and provide the fastest T-SQL query typing ever possible. 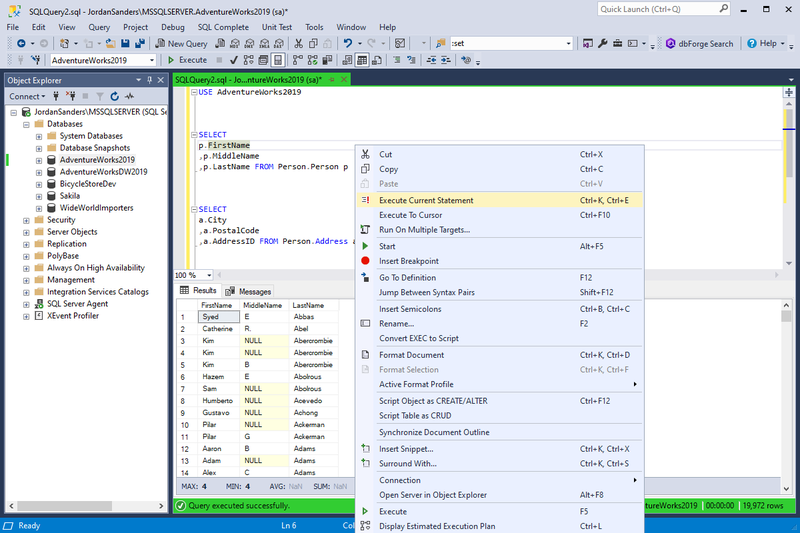 Learn more about the advantages of using dbForge SQL Complete in Visual Studio. 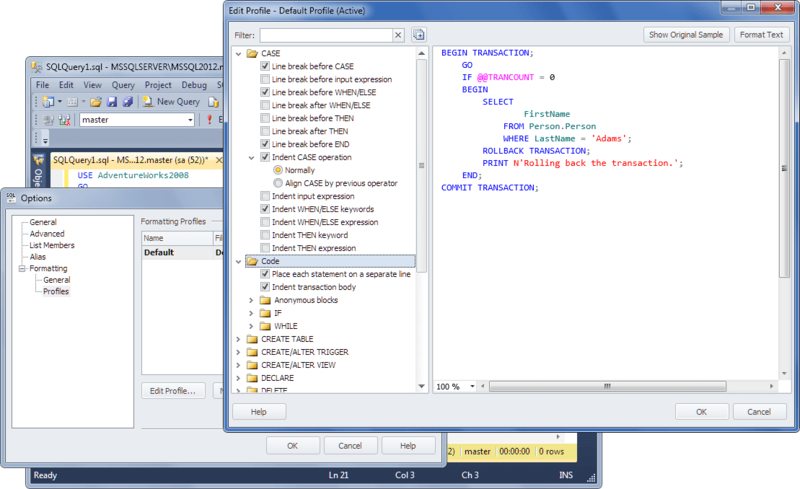 dbForge SQL Complete provides context-based suggestions and formatting in such queries like SELECT, INSERT, UPDATE, DELETE, USE, CREATE (table, procedure, function, trigger, view), ALTER (procedure, function, trigger, view, schema), EXEC, DROP, GRANT, REVOKE, DENY, ENABLE TRIGGER, DISABLE TRIGGER, control flow statements (IF, WHILE), BEGIN ... END blocks. 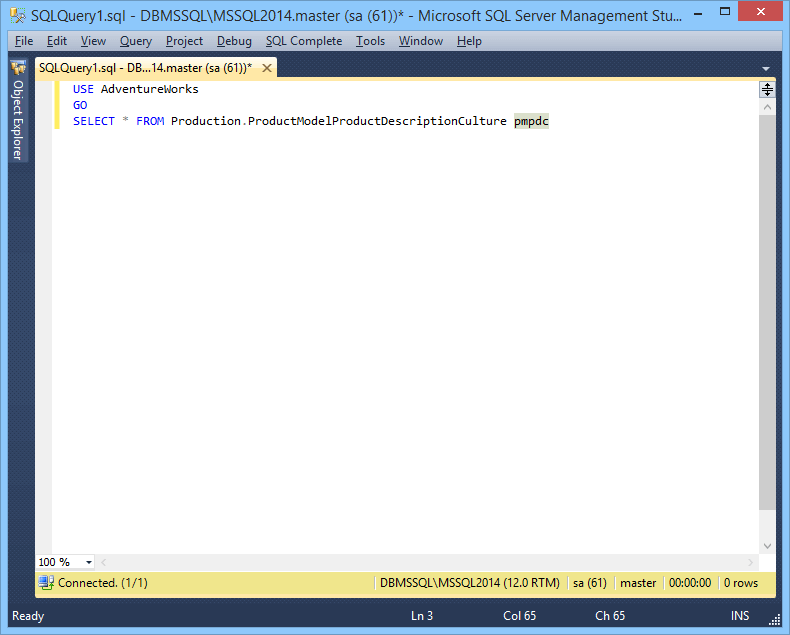 Intellisense of SSMS supports only some of the SQL statements. When typing queries, dbForge SQL Complete saves your time by providing you a list of all available object names from the specified table. Each object type has its own icon, so it can be easily recognized. 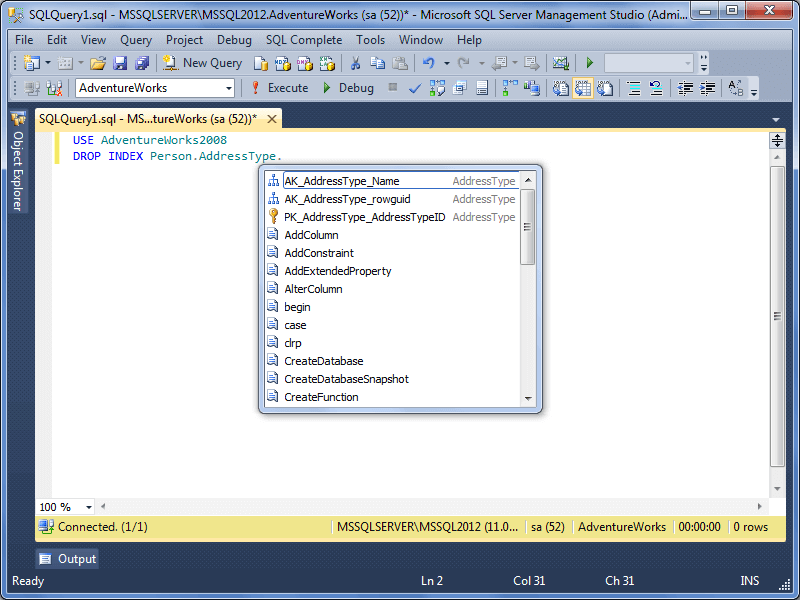 Native Microsoft T-SQL Intellisense also supports different object types but not all of them. Also dbForge SQL Complete offers a list of available keywords to use in the certain position of your code. 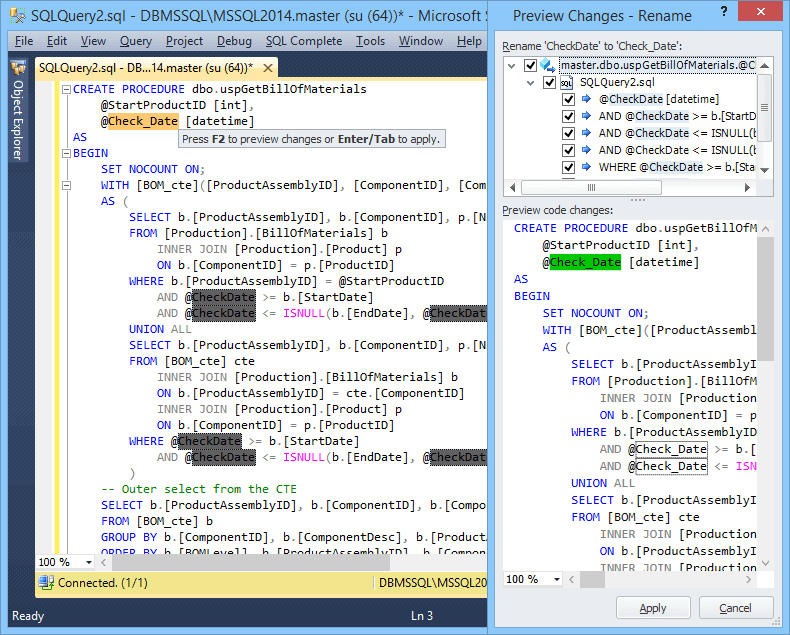 Native Microsoft T-SQL Intellisense doesn't support this feature at all. Context-based prompt of linked servers is not supported in native intellisense of SSMS. If you type first several symbols of a database object name and dbForge SQL Complete finds only one match, the name will be automatically inserted into your query to complete the word. This feature is not supported in native Microsoft T-SQL Intellisense. When typing a query, dbForge SQL Complete analyzes what you are typing and automatically filters names of objects and keywords in the suggestion list. dbForge SQL Complete sorts names of database objects by type and displays most relevant suggestions at the top of the list, others are moved to the bottom whereas native Microsoft T-SQL Intellisense only sorts names of SQL Server database objects in alphabetical order. dbForge SQL Complete displays a list of database objects from the current database or schema even when their names are not specified in a query. 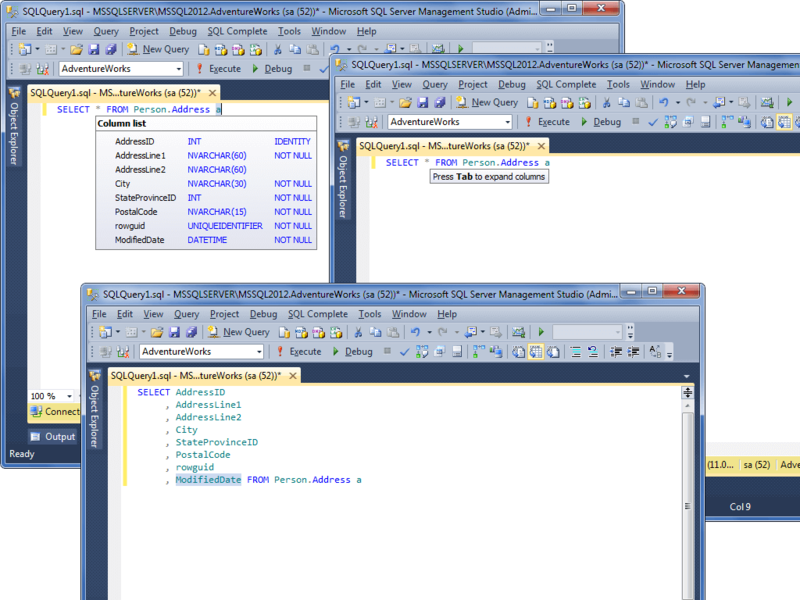 The names of the current database or schema are determined basing on connection properties of the current SQL document. 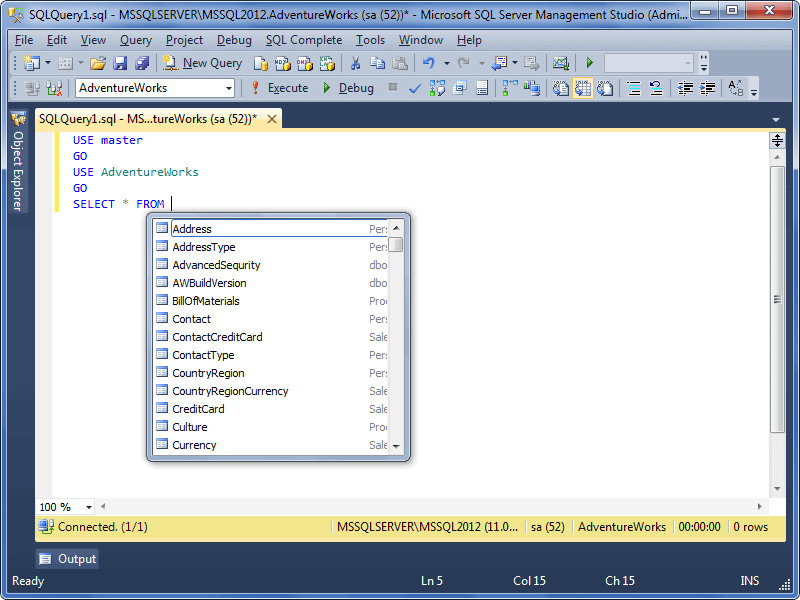 When typing a query in the SQL editor, dbForge SQL Complete analyzes the text you're typing and displays the most relevant suggestions for the current context. There is a possibility to cancel automatic displaying of suggestions or edit delay time for displaying them. 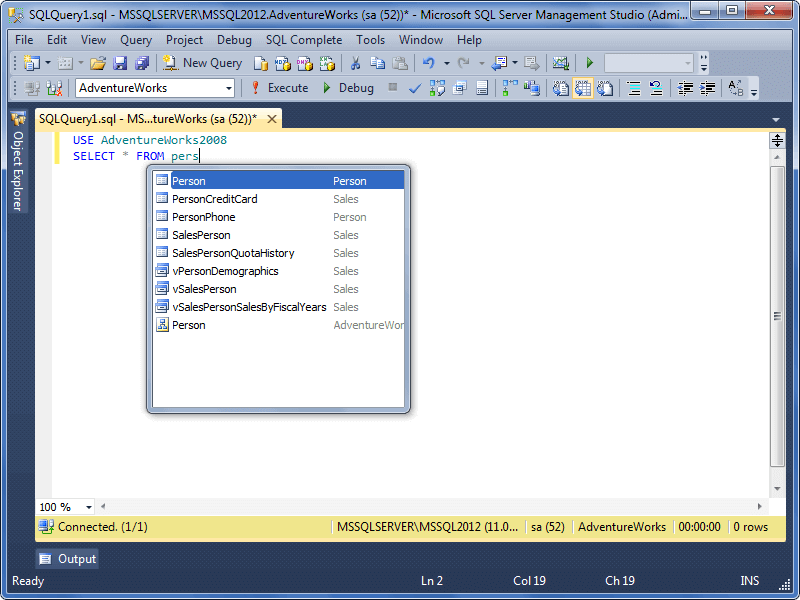 This feature is also implemented in native Microsoft T-SQL Intellisense. A list of available columns for the needed objects (tables, views, etc.) may be inserted instead of the * symbol by pressing the Tab key. For JOIN clauses, dbForge SQL Complete can suggest a full JOIN clause basing on foreign keys, or it can suggest conditions basing on column names and foreign keys. This suggestion is available after the JOIN and ON keywords. dbForge SQL Complete automatically generates aliases for table objects (table, view, function, synonym, sub-query) available in the FROM list of SQL statements. You can also assign custom aliases to a table, view, table-valued function, or synonym, and use alias masks to specify conditions and actions for alias generation. You can also assign custom aliases to a table, view, table-valued function, or synonym, and use alias masks to specify conditions and actions for alias generation. The feature allows you to type just available table names, views, procedures, functions or triggers in UPDATE, INSERT, ALTER, and EXEC statement and expand the statement to the full template by pressing the Tab key. 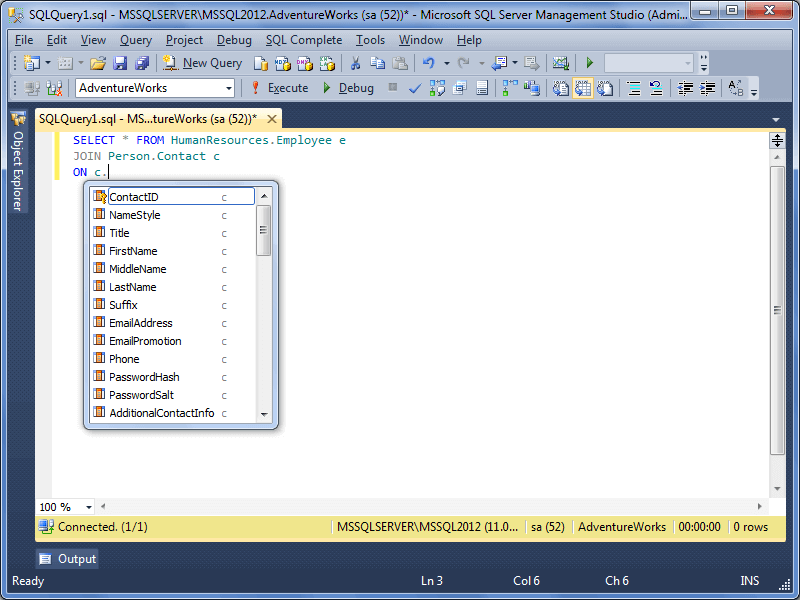 A hint with information about the function and its parameters is displayed when you call any built-in or user-defined function in a query. If you move the mouse cursor to the identifier, information about the database object will be displayed. 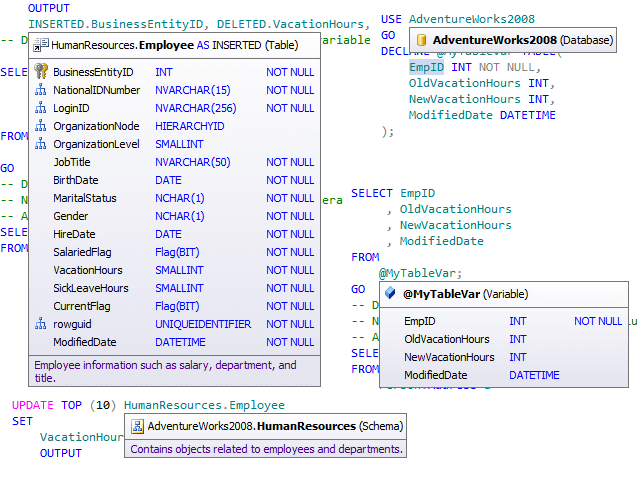 The information may include table column names with data types, additional column properties (e.g., not null and identify attributes), primary, unique, and foreign keys, object type and an available user description. 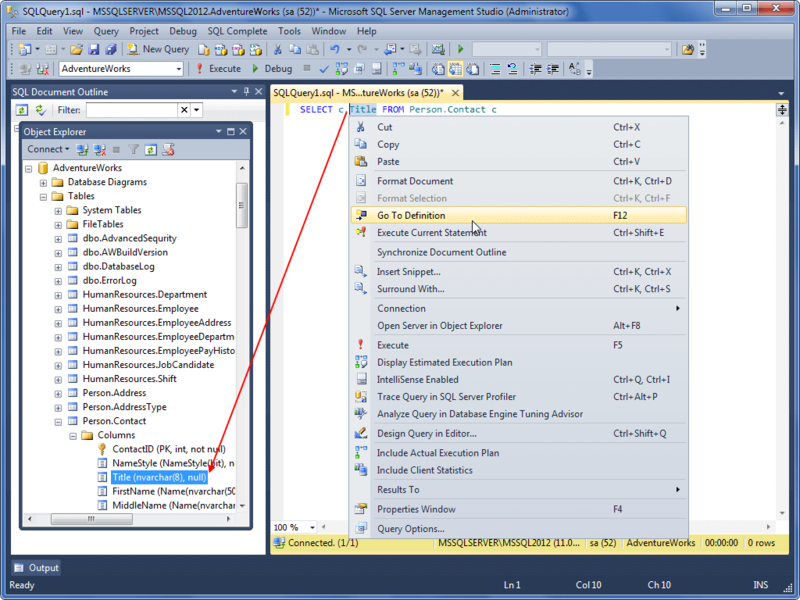 This feature is partially supported in native Microsoft T-SQL Intellisense. 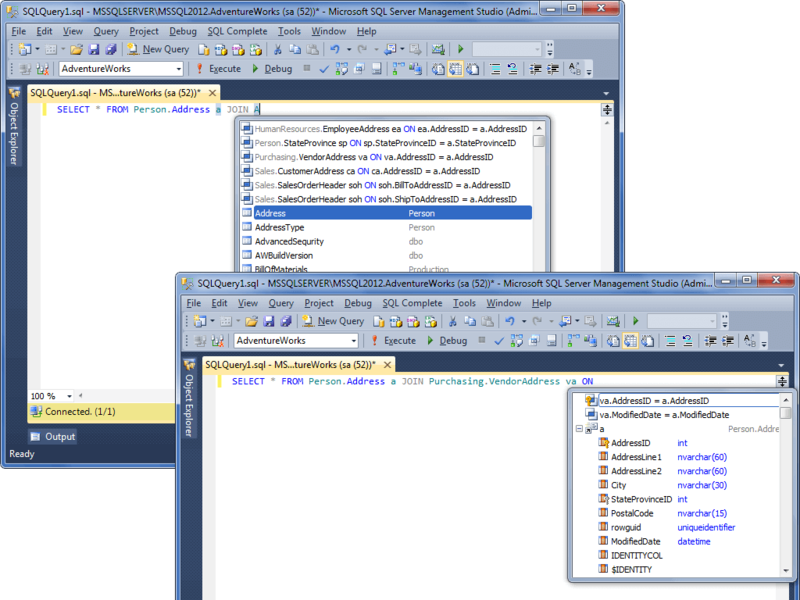 The feature eases navigation in large SQL documents. The current document structure is displayed in the Document Outline window. Also you can synchronize the structure with the text straight from the code by selecting Synchronize Document Outline from the context menu. 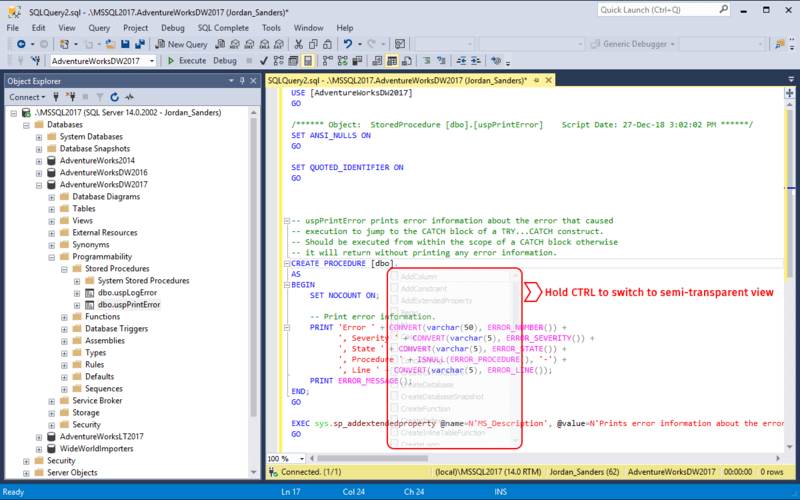 You can navigate from Code Editor straight to the object in Object Explorer. By pressing F12 or selecting the corresponding item from the popup menu when the cursor is over the object identifier, the object will be found in the Object Explorer tree. With the help of the feature you can see all identifier occurrences. When you move the mouse cursor to the identifier, all the identifier occurrences in the text are highlighted. 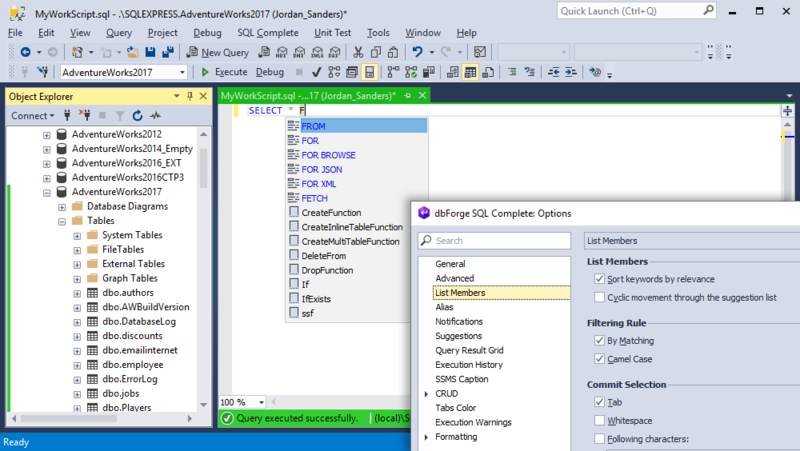 dbForge SQL Complete highlights keywords, built-in functions and other objects in the suggestion list basing on the corresponding settings of SSMS. For convenient reading of SQL code dbForge SQL Complete provides you an opportunity to perform formatting of queries paying attention to case, line breaks, whitespaces, indenting, wrapping, etc. and set up a variety of formatting options. 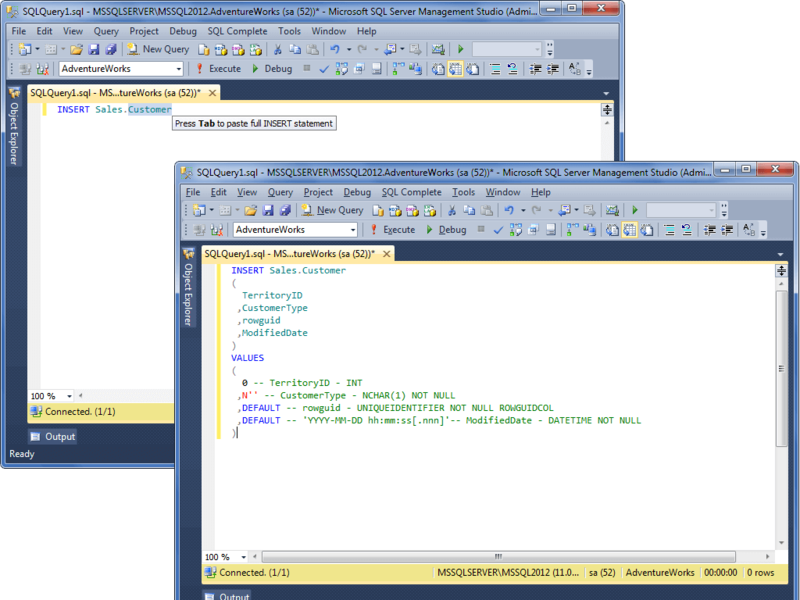 SQL Complete provides an opportunity to execute the current SQL statement without selecting it. You have to just place the cursor in the statement and press Ctrl+Shift+E. The Rename functionality provides an easy way to change an object name for a new one that better reveals its purpose and automatically finds and corrects all references to it. SQL refactoring is available for tables, temporary tables and columns, views, stored procedures, functions, local variables, and SQLCMD variables. You can quickly export the tools setting to a file for further usage. There is a possibility to switch the suggestion box to semi-transparent view by holding Ctrl. dbForge SQL Complete can suggest methods for columns and variables of the varchar(max), nvarchar(max), varbinary(max), and xml types. There is an option for sorting keywords by relevance in the suggestion list. If the option is switched off, keywords are sorted in alphabetical order. This feature allows grouping keywords in the suggestion list by the degree of relevance of a keyword to some specific context. This helps to single out the most appropriate keywords for commit. Being an alternative to native Microsoft T-SQL Intellisense, dbForge SQL Complete will help database administrators and developers to speed up typing SQL queries with no extra actions taking advantage of all its features.